From the dawn of the Internet, and more specifically the increasing use of search engines, links have played a huge role in showcasing the popularity of websites. Search engines used the amount of inbound links to a site to determine its page rank and authority, which enabled sites to attain a higher ranking in results. Soon after, sites began to notice a direct correlation of links from spam sites and link farms, to their positive movement in the SERPS, which only fueled the fire of spam link building in an attempt to strike Google GOLD. In recent years, however, search engines have strived to “clean house” and rid the search results of sites that capitalized on these spam filled resources. According to SEOmoz, this year alone, over 25,000 webmasters have received manual penalties regarding their links and plummeting rankings. Google continues to push their goal of meeting searcher intent for every search conducted. So, now more than ever before, link quality is not only effecting site rankings (both good and bad) but also creating a better environment for searchers to find what they’re looking for without the spammy side effects. How do I know if a link is of quality? 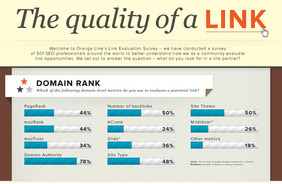 The infographic below highlights the main considerations that need to be made to determine the quality of a link. Always keep in mind, the lifespan of your site. What you do now can effect you days, months, or even years down the road, so quality link building now can only positively your efforts in the future.